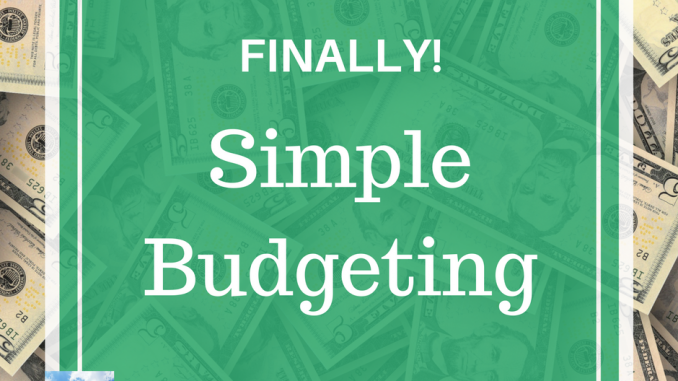 Putting any budgeting plan into action is the hardest part of budgeting. How do we move from good intentions to actually figuring out HOW to make it work? Our lives are complicated. I’ve found that complicated budgeting systems don’t work for me, because they’re too energy intensive. Those of us with energy-limiting illnesses need the simplest budget methods we can find. I remember the K.I.S.S principle from my teen years. Keep It Super Simple. So I set out to find the simplest money managing/budgeting system that I could. As I searched the web, I ran across this article from Living On a Dime. I love her idea of implementing a set amount you can use for the week for eating out, and those little extras that add up. Give yourself that amount in cash each week, and when the money is gone, you’ll have to pack your lunch and do without that vending machine purchase. In order to figure out how much cash you can use per week, total up your monthly income. Then subtract your fixed monthly expenses. If you have money left over, you can decide where to allocate it. You can put it towards a debt, save a portion, and/or decide to give yourself that amount in cash. Divide the left over amount by 4 weeks in order to get the amount of cash per week. For example, when I ran these numbers I got $127 left over for the month. Her Family Budget category includes utilities, medical expenses/insurance, gas for the car, car/home repairs, rent/mortgage, home/rental insurance, debt payments, emergency fund, etc. Most of these are fixed expenses. I highly recommend getting your heating/cooling utilities on a budget with your utility companies. This evens out the monthly bills, instead of having huge spikes during peak heating/cooling months. The Groceries Budget category includes everything that runs out and needs replaced such as food, drinks, toiletries, cleaning supplies, toilet paper, pet food, diapers, wipes, make-up, etc. Her Other category includes eating out, family trips, school events, sports equipment, haircuts, art/craft supplies, and any other optional expenses. 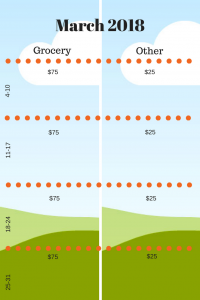 For actual food budgeting, she uses $100 per person per month, and adds an extra $100 dollars per month for non-food items that need replaced as they run out. For my family of 2, this adds up to $200 for food + $100 for non-food replacements per month. When this is divided into 4 weeks, I have $75 to spend per week on this category. With careful choices, this is very doable for me. If I decide to take my left over $127 and allocate $100 to my Other Budget category, this gives me $25 to spend on Other each week. For the first time in years, I have a clear idea of what my income and fixed Family expenses are, and a plan for how much I can spend in my Grocery and Other categories. March’s budget is written down and planned. In the past I waited until the month started, and then felt overwhelmed at making a budget while expenses were happening. If you have struggled with this as I have, I encourage you to take the next 7 days and make March’s budget now. If you do not have an emergency fund, put whatever leftover funds you have for Other for the month into an emergency savings account, and do without Other spending for the month of March. A no-spend month is HARD, but think of how comforting it will be to actually have some money set aside for unexpected expenses. I know I feel a whole lot calmer when I know I have money in my emergency fund. You will too! Finally, I would love to send you email notices of new posts and FREEBIES. I promise not to share your email address with anyone else, and to only send one email per week.